Raphael or Picasso? Monet or Titian? What about Cecilia Giménez, the Spanish grandmother responsible for the botched but now iconic Monkey Christ restoration? Okay maybe that one’s pushing it, but agreeing on the greatest artist to have ever lived is an impossible task. Nonetheless, for the last 500 years one name has hovered near the top of almost everyone’s list: Michelangelo di Lodovico Buonarroti Simoni, famous enough to be known to history by his first name alone. Born into a family of humble means in the tiny Tuscan town of Caprese in 1475, Michelangelo’s staggering achievements changed the course of art forever and led to his contemporaries dubbing him ‘il Divino’ - the divine one. And indeed he must have seemed closer to God than a man to his peers, cranking out masterful studies in human anatomy and psychology for most of his almost 89 years – an impressive age even in the 21st-century, let alone in 16th-century Italy when average lifespans were south of 50. Michelangelo cut his teeth in the Florence of the Medici, and it’s there that he is buried in pride of place in the church of Santa Croce alongside Galileo and Machiavelli. But as the most famous artist of his age, everyone wanted a piece of il Divino - including the popes ruling over Rome 150 miles away. 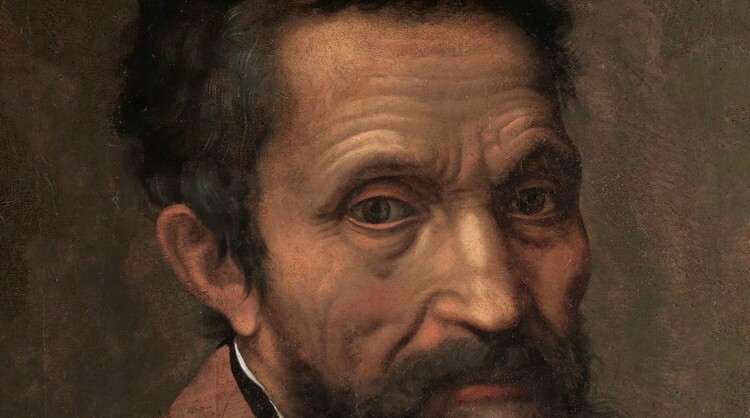 And so from his first visit to the Eternal City in 1496 Michelangelo lived much of his adult life in the city, gracing it with some of the greatest masterpieces of Western art. According to his friend and biographer Giorgio Vasari, Michelangelo was ‘supreme not in one art alone but in all three’ – that is, painting, sculpture and architecture. A true Renaissance man, you’ll encounter his masterpieces in all three forms in the Eternal City – so read on to find out where to see Michelangelo’s art in Rome at its very best. An exploration of Michelangelo’s masterpieces in Rome can only really begin in one place: the Sistine Chapel. The amazing frescoes that Michelangelo painted on the ceiling here at the command of Pope Julius II between 1508 and 1512 are widely considered to be the highpoint of the Italian Renaissance. 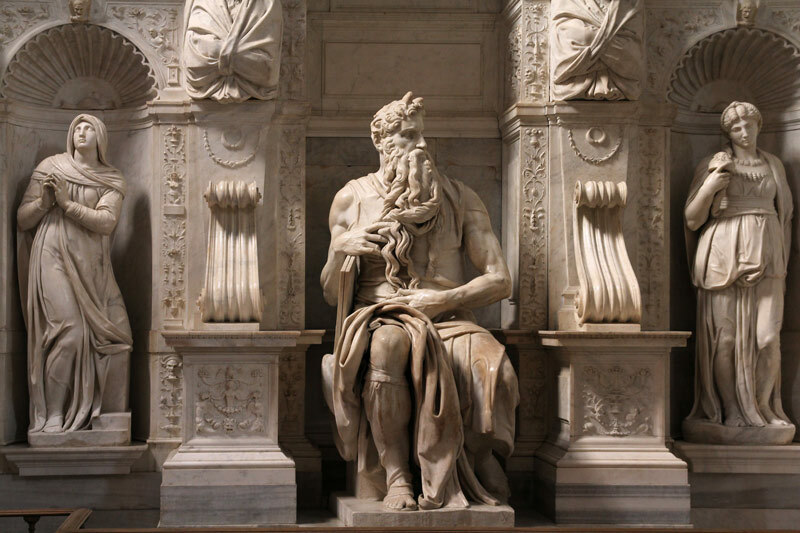 When the fearsome Julius, known as the ‘Warrior Pope,’ decided to redecorate the Vatican’s private papal chapel, he turned to Michelangelo as the only man capable of realising his immense vision. Michelangelo was reluctant to take on the job, considering himself to be a sculptor rather than a painter. But the Pope didn’t take no for an answer, cajoling, threatening and at times even physically assaulting Michelangelo in order to stop him from abandoning the work. 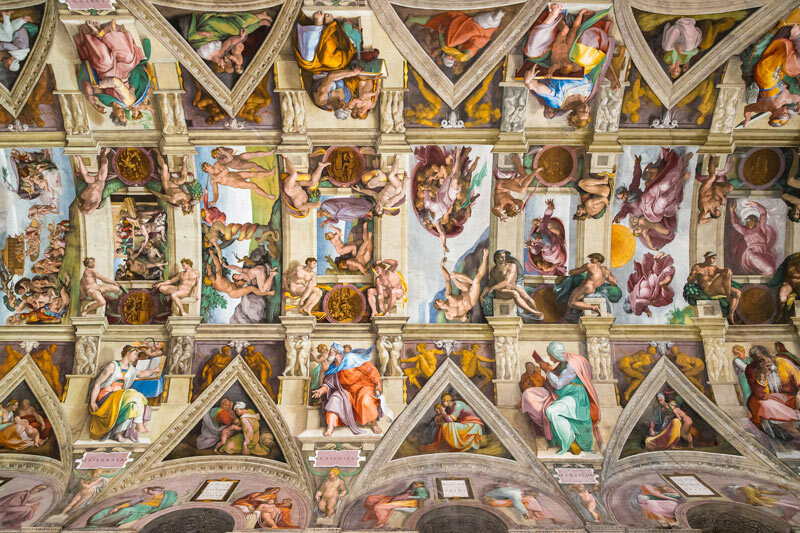 And so in four years of furious creative energy, Michelangelo completed a mind-bogglingly complex scheme comprising of 343 figures over the 12,000 square feet of the Chapel’s immense ceiling. Hebrew prophets, pagan sibyls and athletic male nudes, the so-called ignudi, lounge around the fringes of the vault: at the centre is the entire span of the Old Testament Book of Genesis in 9 panels, from God’s primordial Separation of Light and Darkness up to the near-total destruction of the world in the Great Flood and the salvation of Noah’s Ark. At the very centre of Michelangelo’s epic biblical narrative is the most iconic gesture in the history of art: the trace contact between the fingers of God and Adam that breathes life into the world and sets into motion the long story of humankind. Today the Sistine Chapel forms the spectacular climax of the Vatican Museums’ itinerary, and coming face-to-face with Michelangelo’s frescoes is a spine-tingling experience. Tickets to the Vatican Museums cost €17 (plus booking fee of €4). 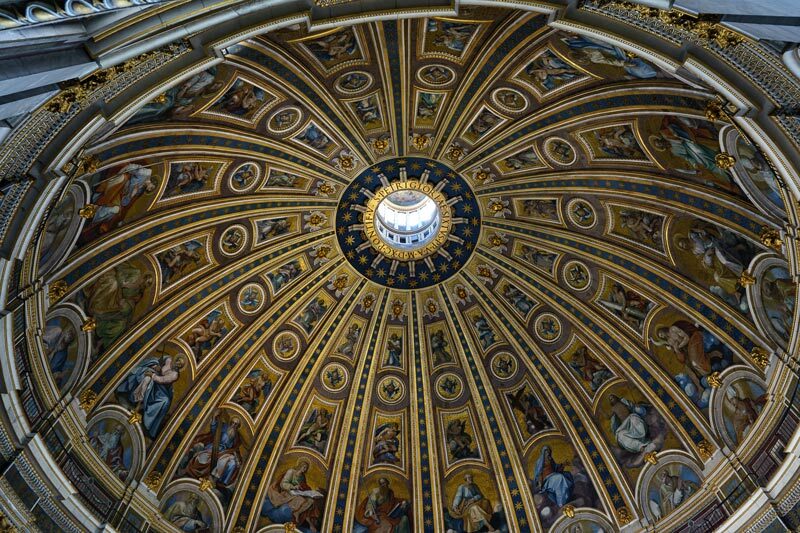 Book your ticket in advance online from the official Vatican museums website (museivaticani.va) to allow you to skip the lines, or join of Through Eternity’s Vatican Museum Tour. Amazingly the young sculptor more than lived up to the hype, and Giorgio Vasari spoke for many when he wrote that it was ‘a miracle that a formless block of stone could ever have been reduced to a perfection that nature is scarcely able to create in the flesh.’ It seems that the usually undemonstrative Michelangelo was himself especially proud of the Pietà, as it was the only work he ever signed. According to legend, shortly after its completion he overheard some Lombard tourists crediting the work to a second-rate Milanese artist. Quietly incensed, the sculptor returned in the dead of night to carve his name onto the strap running across the Virgin’s chest. The story is almost certainly a tall-tale, but the signature on Michelangelo’s Roman masterpiece is there for all to see, a sign of the young master’s awareness of his own burgeoning superstardom. St. Peter’s is open every day from 7 a.m. to 7 p.m. April-September and 7 a.m. to 6 p.m. October-March. Admission is free. 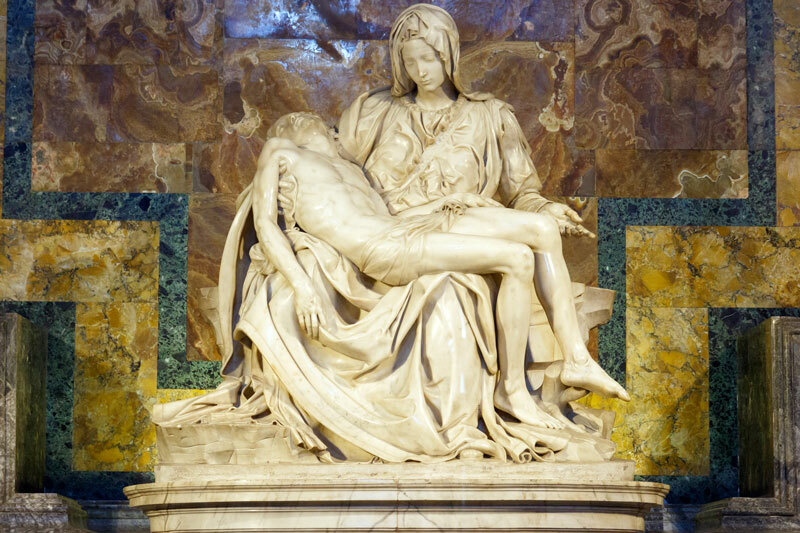 In 1505 Pope Julius II ordered Michelangelo to return to Rome to craft a magnificent tomb worthy of God’s representative on earth. Michelangelo duly designed a massive free-standing funerary monument destined for St. Peter’s Basilica that called for over 40 figures, including the spectacular series of struggling slaves, now divided between the Louvre in Paris and the Academia in Florence. Michelangelo was forced to pause the project when the capricious Julius ordered him to fresco the ceiling of the Sistine Chapel instead; when a much reduced monument was finally assembled in the unassuming church of San Pietro in Vincoli in 1545 it was a shadow of the grandiose sepulchre imagined by Michelangelo, who considered the doomed project to be the greatest tragedy of his life. What he did manage to finish, though, was spectacular. At its centre is an 8-foot tall statue of the Hebrew prophet Moses, a landmark of Renaissance sculpture. Michelangelo was reportedly so taken by what he had hewn from a massive single block of Carrara marble that he implored the silent stone colossus to spring to life. When the seated prophet ignored his command to ‘speak!’ the impetuous Michelangelo clattered his life-like creation’s thigh with a hammer. Moses is every inch the charismatic leader described in the Book of Exodus, flowing beard twisted between his fingertips and the tablets of the 10 Commandments clutched in his muscular arms. Strangely, a pair of horns protrudes from his head – the result of a biblical mix-up when St. Jerome rendered the Hebrew for ‘rays of light’ as ‘horns’ in his 4th-century Latin translation. Moses’ eyes seem to flash with fury, and his startlingly dramatic expression perfectly expresses the famously cantankerous Michelangelo’s ‘terribiltà’ – the unique capacity of his works to inspire terror in all who gazed upon them. In Moses’ startling psychological intensity, we can see a little of the great artist himself. San Pietro in Vincoli is open every day from 8 a.m. to 12.30 p.m. and 3.30 p.m. to 6 p.m. Admission is free. In 1514, a reluctant Michelangelo agreed to carve a sculpture of the naked Resurrected Christ for the church of Santa Maria Sopra Minerva at the behest of the Roman patrician Metello Vari. Michelangelo had to abandon his labour after discovering a terminal flaw in the marble, and quickly knocked out a second version between 1519-20 to satisfy his increasingly impatient patron. 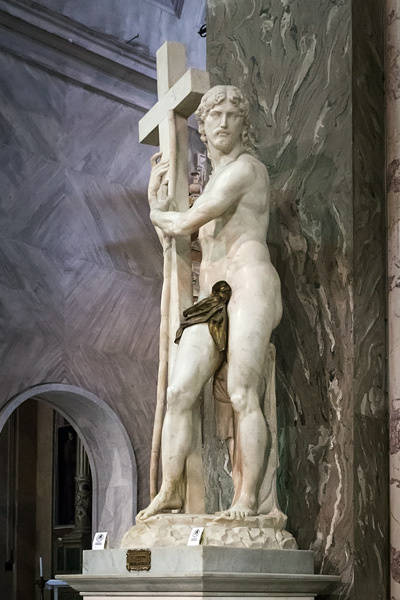 It’s unclear why the twisting Risen Christ was portrayed naked (the silly loincloth he now wears is a prudish later addition), and the somewhat diffident Jesus clutching a miniature cross perhaps doesn’t pack the emotive punch of some of Michelangelo’s other works. Nonetheless, contemporaries were apparently mightily impressed with the figure’s sinuous contrapposto: the painter Sebastiano del Piombo reportedly gushed that Christ’s knees were worth more than the rest of Rome put together. Head to the spectacular Gothic church just around the corner from the Pantheon to judge for yourself. Santa Maria Sopra Minerva is open every day from 7.30 a.m. to 7 p.m. On the weekends the church is closed for lunch. Admission is free. Nearly 30 years after the completion of the Sistine Chapel ceiling, the now aging Michelangelo was prevailed upon by Pope Paul III to return to the scene of his greatest triumph. 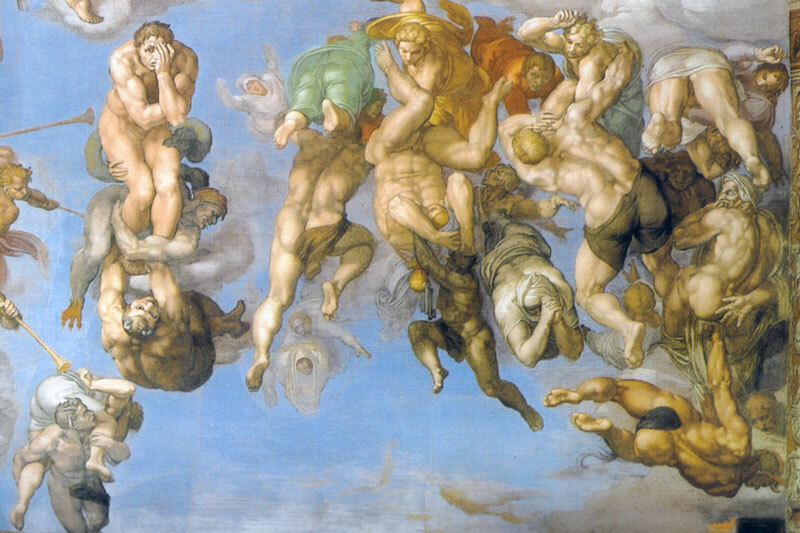 Between 1536 and 1541, Michelangelo would paint an immense fresco on the altar wall of the chapel depicting the apocalyptic drama of the Last Judgement, where the saved are carried to heaven on the wings of angels and the damned dragged downwards to hell by devils. At the centre of everything is Christ: modelled on the ancient Apollo Belvedere, he imperiously damns the souls of the sinful with one hand as his other draws the spirits of the saved upwards towards their eternal heavenly home. Surrounding Christ are the naked bodies of Christian saints and martyrs: look out for muscular St Bartholomew – Bartholomew was flayed alive, and here clutches his own lifeless skin. The fleshy sack conceals an amazing secret self-portrait - his sagging features are those of none other than Michelangelo himself. Look out too for the naked man being dragged down through the clouds towards eternal torment by a pair of gleeful devils chewing viciously at his flesh: as the awful reality that he has been eternally damned by Christ dawns on him, he clutches his face in his hands in a powerful gesture of pure despair. To Renaissance viewers for whom the prospect of heaven and hell were vivid realities, the message of the great painting could hardly be more powerful. Aside from his skill as a painter and sculptor, Michelangelo was also a highly respected architect. He was entrusted with some of Rome’s most important construction projects in the 16th century, not least the design of Piazza del Campidoglio on the Capitoline hill. The Capitoline was the smallest but perhaps most important of ancient Rome’s seven hills, home to the massive temple of Jupiter Optimus Maximus and final destination of Roman triumphal processions. In the Middle Ages it was a centre of the city’s political scene, but by the 16th century was looking a bit run down. Embarrassed by a failed procession up the venerable but muddy slope when the Emperor Charles V visited the Eternal City in 1536, Pope Paul III ordered Michelangelo to renovate the space around a magnificent bronze statue of Marcus Aurelius (at the time thought to be Christian emperor Constantine) that he had moved there from San Giovanni in Laterano across town. Michelangelo came up with a brilliant trapezoid-shaped piazza to frame the ancient emperor on horseback, approached from the city below via a wide ramp known as the cordonata. The whole ensemble is centralised on the façade of the Senators’ palace (also designed by Michelangelo) behind; to complete the absolute symmetry of the design Michelangelo restored the palace of the Conservators on one side of the square and planned an identical structure facing it on the other, the Palazzo Nuovo. Today these palaces house the fabulous Capitoline Museums, and with its great view over the Roman forum the piazza is one of the most charming places to drink in the Roman sunset. 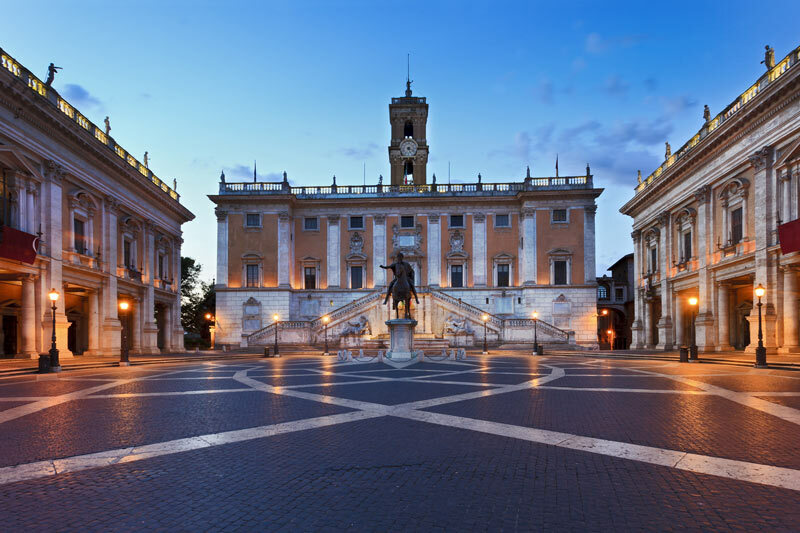 The Capitoline Hill is a public square that is always open and free to visit. The Capitoline Museums cost €15 and are open every day from 9.30 a.m. to 7.30 p.m.
Everyone who was anyone in sixteenth-century Italian architecture had a hand in bringing the design of new St. Peter’s Basilica to fruition, and Michelangelo was no exception. The grandiose edifice slated to replace the venerable but crumbling Constantinian basilica was to be the largest church ever built, and Michelangelo’s despised rival Bramante got the ball rolling in 1506 with his design for a massive centrally planned church in the shape of a Greek cross. But Bramante died before the works could be completed, and the task of overseeing the project finally fell to the typically reluctant and aging Michelangelo in 1547. Amongst Michelangelo’s various modifications to the design, the most famous and influential was the dome and its massive supporting drum, initially conceived of by Michelangelo as an homage to Brunelleschi’s famous dome that caps Florence Cathedral. But what Michelangelo came up within Rome ultimately forged its own tradition - its soaring and elegant profile dominate the city’s skyline, and at nearly 450 feet high remains the world’s tallest dome to this day. Climb its 320 steps to the top and enjoy an incredible view all across the city. The final Michelangelo masterpiece on our list might be one of his lesser-known contributions to Rome’s urban landscape, but the church of Santa Maria degli Angeli e Martiri is a wonderful testament to the artist’s skill and ambition in the final years of his life. The basilica occupies the space of part of the colossal ancient Roman baths of Diocletian - by the 16th century a picturesque ruin where artists came to examine classical decorations and bandits roamed in search of loot. When Pius IV was elected pope in 1559, he commanded the seemingly immortal 85-year-old Michelangelo to produce plans for a church built into the baths. Following the hectoring of the fanatical Sicilian prelate Antonio del Duca, the church was to be dedicated in honour of the Christian slaves who supposedly died building the baths under the persecuting pagan emperor at the beginning of the 4th century. Michelangelo respected the integrity of the ancient complex, transforming its surviving walls into the façade of the new church. The unassuming ‘ruined’ brick exterior conceals one of Rome’s grandest houses of worship within. Massive though it is, the church actually occupies the space of just one part of the ancient baths - the frigidarium, or cold water pool where Romans cooled off after being scalded in the nearby caldarium. 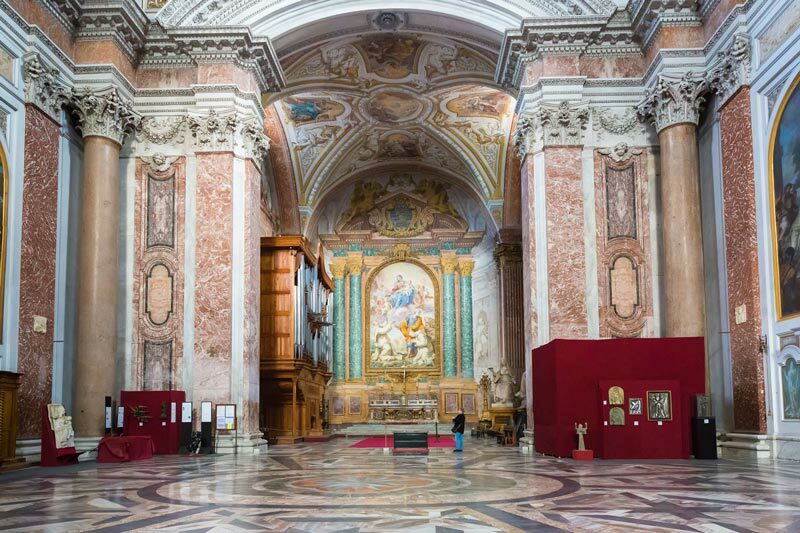 The elaborate paintings and marble encrustations inside are the work of an 18th-century remodelling, but the vast space of the church gives an insight into the inspiration Michelangelo drew from the majestic scale of ancient architecture. According to his Renaissance contemporaries Michelangelo was the only modern figure that could match the brilliance of the ancients, and so the church-bath of Santa Maria degli Angeli is a fitting last artistic will and testament to this towering genius of the Renaissance: the not quite immortal Michelangelo would finally die in 1564, just shy of his 89th birthday. The church is open daily from 7.30 a.m. to 6.30 p.m. and is free to visit. To visit the remainder of the baths, which now house part of the National Roman Museum, tickets cost €10. The museums are open Tuesday to Sunday from 9 a.m. to 7.30 p.m.
-> Why did Michelangelo choose Jonah on the Sistine Chapel ceiling?